At the fair with grandpa taking a good look at the cows. Couldn't convince my husband to ride with me on the ferris wheel. Oh, well...maybe when the kids get a little older they'll ride with me. That looks like a fun day! Our cows at the fair where behind fences :/ I'm a little afraid of cows, I never realized how big they are! Nothing like it, I love your =wheel picture by the way. I love the state fair (minus the heat)! I used to like the ferris wheel too, but now I'm a chicken! 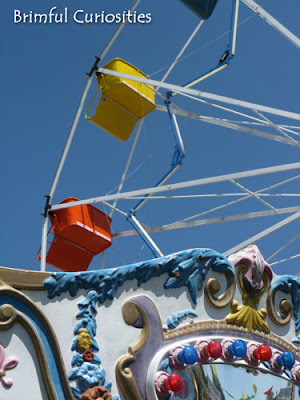 Great photos, makes me want to head to the fair. Phooey on your husband for not joining you on the ferris wheel. They are such fun! I love fairs! They're so fun and carefree - a happy place to be! Gosh I love this! Being able to spend time with grandpa is so precious. I with my children had that you know. As of late, my girls keep asking me to take them to the fair. It's too warm here at the moment, but the cooler weather and the fair are coming very soon. Can't wait! I've never seen them out so close like that! Awesome! Oh, what a great day! We didn't make it to a fair this year :( Looks like you guys had so much fun! TOO cute! Looks like everyone had the fair this past week or so! Ours isn't until Oct...I doubt we'll make it since Isabella is so young. Nice shots. Looks like fun. I love seeing fair pictures and what a cute shot!! Very nice feeling it gives me in the first photo! The second one looks like fun and colorful! How fun! I love the fair! We missed the fair this year. Great pictures. I would have ridden with you. What great photos! 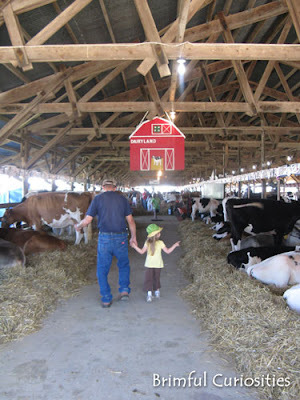 We love going to our county fair too, I'm so sad it's over all ready. The fair is the best!! My husband and daughter tried to go on one at the fair but the line was long and moving slooooowly, so they gave up. Maybe next year!! Thanks for coming by!! Aw, that looks so fun!! I bet she had a great time with Grandpa.